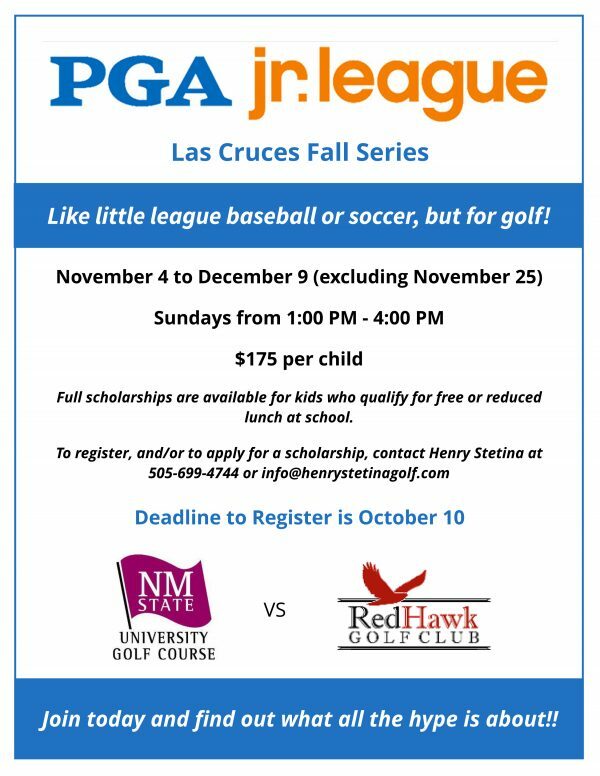 Like little league baseball and little league soccer, the NMSU Golf Course is pleased to announce the PGA Jr. League of Las Cruces. The NMSU Golf Course will take on Red Hawk Golf Club Sundays, Nov. 4 – Dec. 9, from 1-4 p.m. (excluding Nov. 25 for Thanksgiving weekend). While the cost is $175 per child, scholarships are available for kids who qualify for free or reduced lunch at school. To register and/or apply for a scholarship, contact Henry Stetina at 505-699-4744 or info@henrystetinagolf.com. Deadline to register is Oct. 10. Join today and find out what all the hype is about.